Delightful new shrub rose from the Knockout Rose series. Now you can add sweet lemony yellow to your all-summer rose show. Sunny is the first Yellow Knockout Rose, and it comes with a neat little twist. Amazing abundance of blooms and a lovely scent, too. The flowers open bright golden yellow and age to a soft buttery hue. Excellent vigor, even in cold climates. 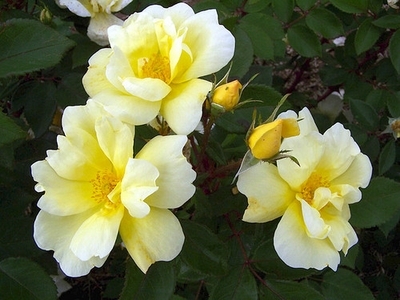 You’ll enjoy excellent disease and pest resistance from Sunny Knockout Roses. Knockouts are incredibly easy to grow shrub roses. They adapt to most soils and a wide range of climates across the country. So reliable, they are a favorite among landscape professionals and homeowners too. The blooming just goes on and on when you grow Sunny Knockout roses. This free flowering shrub rose is one blooming machine from late spring until frost. Easy to grow Sunny Knockout Roses deserve a space in your yard. Enjoy it as a single specimen or a striking designer hedge. Your new rose bushes will have beautiful glossy foliage that remains disease free all season. The magic heats up in fall when the chill turns the leaves to bold burgundy. Imagine the show the yellow roses will make against such vivid foliage! You get three seasons of beauty and a green thumb with Sunny Knockout Rose. Our customers rely on us to provide them with fast growing, healthy landscape roses. Your new yellow rose bushes will arrive in great shape, ready to create instant beauty in your yard. Don’t delay in reserving some Sunny Knockouts right away. This is their second season on the market and availability won’t last long.